Been wanting to share your unique spiritual experiences? Stumped about where to start? Join us! Steps, mis-steps and lessons learned – these are our spiritual path. 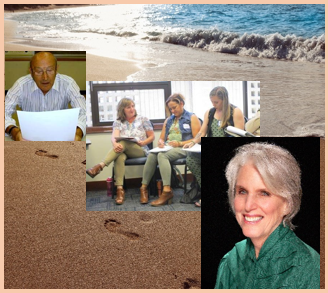 Join this new 8 week workshop that equips and motivates both beginning writers and published authors new to the memoir form with tools to create captivating and inspirational life stories. Why attend? Early Bird Discount: Save $50! Your writing coach is Ina Hillebrandt, Fortune 500 consultant, spiritual seeker, speaker and author. She’s been leading creativity and writing workshops for companies, groups and individuals for over twenty years. Author of the classic guide, “How to Write Your Memoirs…Fun Prompts to Make Writing … and Reading … Your Life Stories A Pleasure!” her book “Pawprints” and students’ book, “Stories From The Heart, Vol. 2” were named Best Sellers by Amazon.com.